At this point the project is essentially complete and is undergoing system testing. The Operations and Maintenance Agreement is not delaying project progress. It is on schedule to meet its Revenue Service date of late 2019 as the Board heard at its April 4th meeting. 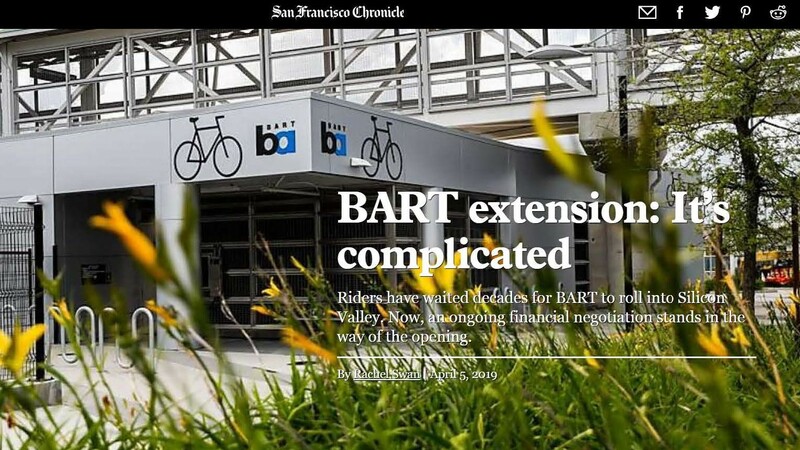 The planned meeting between BART and VTA Board members was cancelled to give the respective staff members the opportunity reach agreement on further details of the complex Operating and Maintenance Agreement proposed between the organizations. VTA has a contractual obligation to continue to fund the operations, maintenance and improvements related to the BART extension into Santa Clara County, and VTA would be funding the operations, maintenance and improvements related to the BART extension primarily with 2008 Measure B tax revenues and the fare revenues on the extension. In addition, if needed, VTA may elect to supplement 2008 Measure B with grant revenues, in amounts that will support expenditures compliant with the grant purpose. VTA would dedicate the Transportation Development Act (TDA) revenues if 2008 Measure B expires or is exhausted with no suitable replacement in place. For the Berryessa Extension, the fares will be zone based and we don’t envision having a surcharge on Phase 1. Prior to revenue service on Phase 2, ridership, revenues/expenses will be evaluated and a determination will be made whether there should be a surcharge or not.